I have a scar very red (purple) after one year...the dermaroller does something for the redness? is possible bring back the skin like at least the surrounding ? Re: Can dermarolling diminish the redness of a scar? Stamp it every three weeks with a 1.5 mm dermastamp (the one with 35 needles) and apply our 0.1% Tretinoin cream right after stamping and also about three times a week (without stamping). Tretinoin will initially make the scar even redder but it will subside and long term, Tretinoin helps diminishing redness. If you do not have a dermastamp and you do not want to buy it, use the microneedling tools that you already have. There is currently no method that can completely remove a scar. You can only improve its appearance and make it less visible. just remove all the redness is possible? 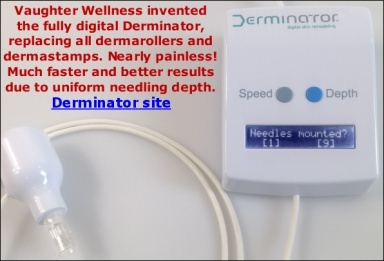 there are other dermatological ways to do together with the dermaroller? It depends what is the origin of the redness. Whether it is vascular (dilated blood vessels in the scar) – a scar that is not yet mature has increases blood flow to help healing. The scar is red and blanches white with finger pressure. Once the scar has fully matured it usually does not blanch with finger pressure. You can have vascular laser done (it seals blood capillaries by heat) but it is expensive and often not working very well or the redness comes back due to capillaries being re-formed. Also, the dilated capillaries are there to help healing so I am not sure whether sealing them is a good idea. Stamping or rolling does not seal capillaries. Other reason for redness is that the skin reacted to the injury by producing too much skin pigment melanin (in this case try hydroquinone cream or Tretinoin cream and stamping). I can use the dermaroller two months after the formation of scar or is it too soon?There is no way to prevent the redness acting immediately with some product or system? >There is no way to prevent the redness acting immediately with some product or system? one month after a revision of scars in possible?there is a minimum amount of time to wait after the revision of a scar? It depends how the scar revision was done. If they cut out the scar and stitched the skin back, it can take quite a long time to heal so wait about one month. If the scar revision was done by a method that heals very quickly, you do not have to wait that long.